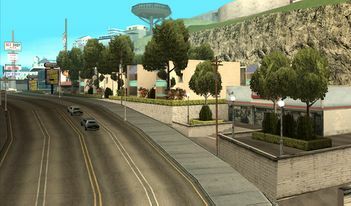 Mulholland, Los Santos, as viewed to the northeast in GTA San Andreas. The southern low-lying portion of Mulholland borders Temple and consists of commercial businesses and low-grade accomodations. 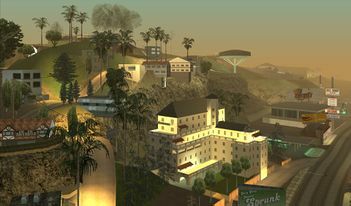 Mulholland is a rich neighbourhood in Los Santos, San Andreas, named after Steven Mulholland, a Los Santos artist for the game. Mulholland is located in the northwestern area of the city. Richman is located west of the district, Mulholland Intersection and part of Red County from the east, Red County and Dillimore from the north and Vinewood from the south. The district is situated high on the hills, most roads are uphills, downhills and hairpins, large villas and mansions are present in the district. However, it is unknown whether the residents are wealthy and rich or not since the cars moving in the district are poor cars. Richman is actually considered more up-scale than Mulholland. This is evident by the types of houses that contrast with eachother: Richman having more traditional mansions, and Mulholland having more stilt houses that aren't very appealing. Also, the roads in Mulholland are more narrow and ridden with cracks, in contrast to Richman's more refined, wider roads. One of the earliest game's missions, Madd Dogg's Rhymes, was given by OG Loc, you were supposed to go to Madd Dogg's Crib in Mulholland, and steal his rhyme book, to bring it to OG Loc. Later in the game, after saving Madd Dogg's life, Dogg tells Carl about his mansion, which was taken by a Los Santos Vagos member called Big Poppa. CJ and the San Fierro Triads get the mansion back, leading to CJ becoming Madd Dogg's manager. Mullholland is based off the real-life area in LA called Mulholland Drive, located in the LA Hills. It too also features wealthy residents and mansions. 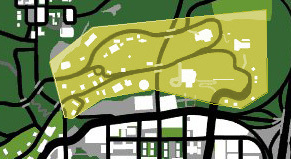 During the Los Santos Riots, Mulholland is the only area not affected by the riots and there will be no civil disobedience there, making it the safest area of Los Santos during the riots. This page was last modified on 21 December 2012, at 04:14.